In Much Ado About Nothing the road to true love never does run smooth. This is Shakespeare’s strategic guide to the ‘battle between the sexes’, loaded with comic incident, bumbling security guards, squabbling brothers, and mismatched lovers. The play is full of suspense, high drama and delightful comedy, brought to life, with powerful acting and exquisite costumes. 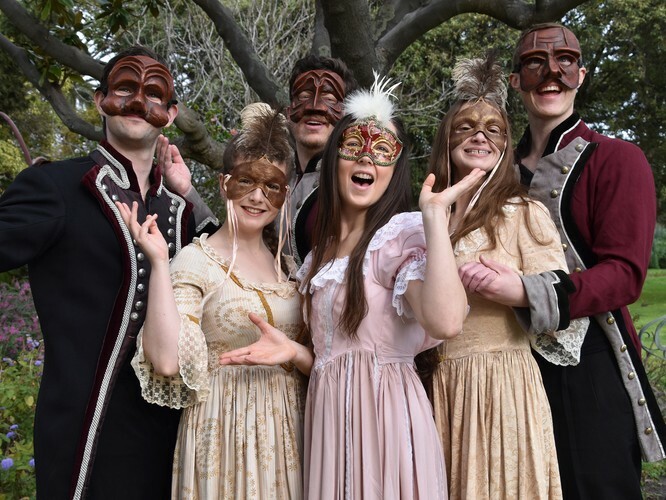 This year marks the 12th year Ozact has been performing at Williamstown Botanic Gardens, and over that time Ozact’s Shakespeare productions have become an Autumn tradition and a much anticipated Melbourne event. The seaside setting of one of Victoria's great heritage gardens, with its formal palm avenue surrounded with lush green lawns, meandering pathways and a stunning array of rare trees, and floral boarders.make it an ideal setting for Shakespeare's plays. So share with Ozact Shakespeare’s Autumn frolic Much Ado About Nothing in the glorious surrounds of Williamstown Botanic Gardens. Visit the Ozact website for season tour dates and venues, ticket bookings, and detailed production information.